Mouser Electronics, Inc., the New Product Introduction (NPI) leader empowering innovation, announces that it will be a major components sponsor of Mars Rover Manipal, a multi-disciplinary student team from Manipal University striving to design and build a next-generation extraterrestrial rover. Mars Rover Manipal is set to compete at the University Rover Challenge (URC) 2018, May 31 through June 2 at the Mars Desert Research Station in Hanksville, Utah, USA. URC is an annual robotics competition organized by The Mars Society that features Mars rovers designed and developed by undergraduate students from around the world. The event will showcase 36 teams from all over the world shortlisted from the 95 applicants, including five teams selected from India. The successful Mars Rover Manipal team finished in eighth place at URC 2017 — the highest-placing team from Asia — and is excited to enter their rover, “Airawat,” in the URC 2018 competition. 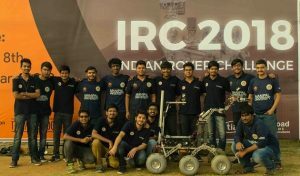 In addition to being Asia’s top team in URC 2017, Mars Rover Manipal won the inaugural Indian Rover Challenge, held in January 2018. For the past two years, Mouser Electronics has been the components sponsor of Mars Rover Manipal. The team uses a variety of components and connectors available from Mouser to enable the rover’s capabilities in harsh environments. The rover employs SparkFun LIDAR lite V3 optical distance measurement sensor as a key component in its autonomous obstacle detection system. Additionally, the rover’s modular robotic arm, Power over Ethernet (PoE) communications system, and motor control systems use Phoenix Contact connectors and injectors to support the functionalities required for Mars exploration.